Once, when Wes Craven was young, he was looking out his bedroom window and saw a homeless man walking down the street. The man stopped and looked up at Craven, revealing a heavily scarred, disfigured face. Scared, the boy jumped back from the window and waited for the man to leave. After a few minutes, he looked out the window again, and the man was still there, staring directly at him. He then headed for the entrance to the apartment building and could apparently be heard climbing the stairs. 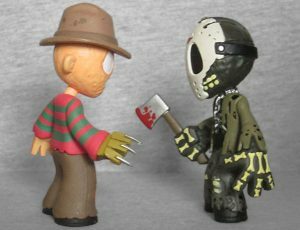 The encounter stuck with Craven, and was one of the factors that inspired the creation of Freddy Krueger. 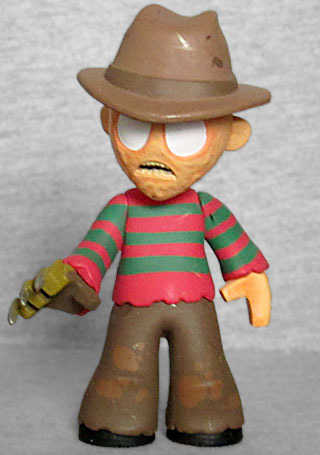 Freddy's head is sculpted with a texture meant to represent his burned flesh. He has his trademark fedora, and his mouth is open in a tooth-baring frown. His stripey sweater is tattered around the edges, and has the stripes on the arms as well as the body (because that's what people expect to see). His hat and pants are painted with splotches that may just be dirt, but might as readily be blood. 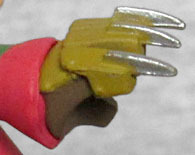 His little glove is detailed well, with silver blades sticking off the Mystery Minis' typically square fingers. Freddy Krueger, in the first movie, was a metaphor for puberty, something that changed or got lost as the series went along. But he's a classic movie maniac (hey, I just got that name!) and the Mystery Minis style seems appropriate for the silly goofball personality he developed in later films.